Due to allegations of racism, Paula Deen’s cooking empire continues to crumble like the crust of her famous Apple Crumb Pie. 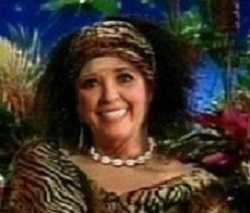 In a radical publicity stunt, Deen moved to Nigeria in an attempt to repair her tarnished image within the African American community and regain support from her corporate sponsors. This entry was posted in Breaking, News and tagged African American, Cooking Show, humor, Nigeria, Paula Deen, Racism, Satire on July 1, 2013 by The New Porker. Hilarious. How ’bout: Paula Deen marries a Black man. LOL@thatone. It’s funny you mention that, because our African correspondent actually witnessed Paula Deen and David Chapelle getting awful intimate at a Nigerian cafe. Could it be love? We’ll keep you updated as their relationship develops. Now that would make news. Oh, this just in: The Klu Klux Klan can be added to the numerous sponsors who have dropped Paula Deen. Thanks, Kushite! We dig your site, too! Thanks a lot! Greatly appreciated! !